Here’s an odd thing. Until about two months ago, I didn’t like tomatoes. I was that annoying person who would actually pick them out of sandwiches – and moan that they’d left tomato “gunk” in there. 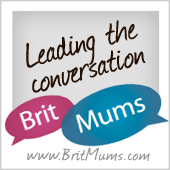 Then my toddler started loving cheese and tomato on toast. And, I don’t know if it’s the repeated exposure to them, the eating them and saying “yuuuuuum” with enthusiasm, or what, but suddenly I’m loving tomatoes. I’m literally eating them by the handful. So when the British Tomato Growers’ Association, in a bid to raise awareness of the British tomato industry, sent me these lurvely tomato-based recipes, I was more than a little interested. The association wants to get us shoppers to specifically chose British toms when doing their weekly shop – and as it’s currently the height of British tomato season, there are a wide range of locally grown tomatoes in stores. 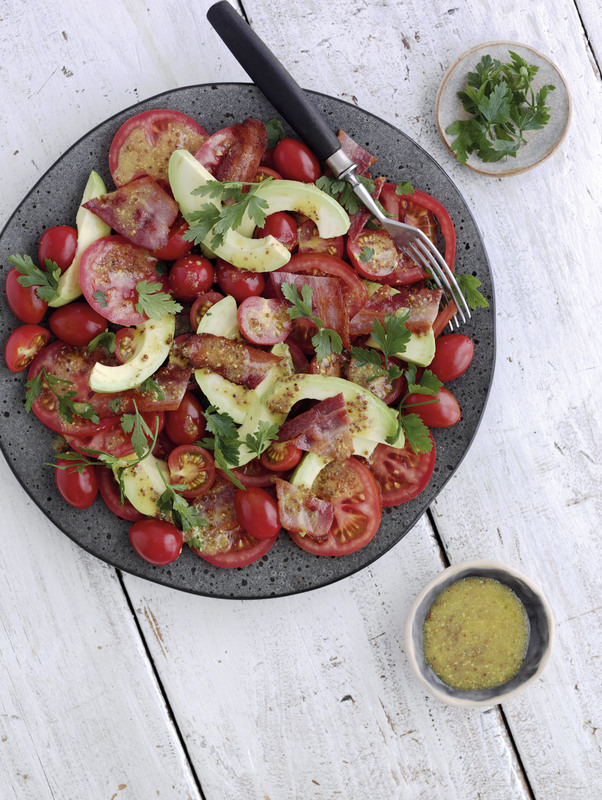 This gorgeous platter of tomatoes uses a trio of British favourites – classic, cherry and baby plum – with sliced avocado and crispy bacon, dressed with a wholegrain mustard, cider vinegar and olive oil dressing. Yum! 2 Share the slices of classic tomato between 2 serving plates, or arrange them on 1 large platter. Scatter the cherry tomato halves and baby plum tomatoes on top. 3 Slice the avocado neatly, and arrange on top of the tomatoes. Put the rashers of bacon onto the grill pan and grill until crispy. 4 While the bacon is cooking, make the dressing by whisking together the olive oil, cider vinegar and wholegrain mustard. Season with a pinch of sugar, salt and pepper. 5 Snip the bacon rashers over the tomatoes, then serve, sprinkled with the dressing and a few basil leaves. 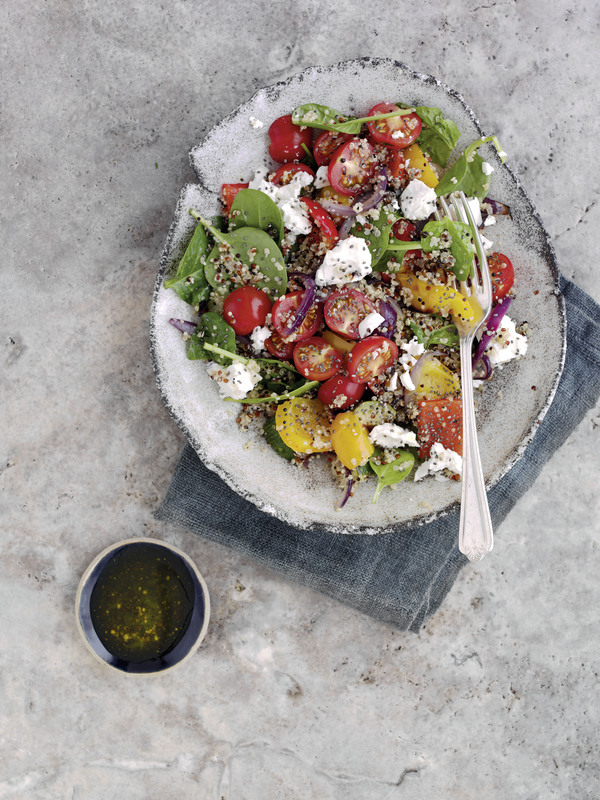 Cook’s tip: Choose you own favourite British tomatoes for this wonderful salad – try a combination of Beef, Large Vine, Classic, Baby Plum or Cherry – just aim to choose 3 varieties with a size or shape variation. 1 Preheat the oven to 200°C, fan oven 180°C, Gas Mark 6. 2 Rinse the quinoa in a sieve, then put it into a saucepan with the stock powder or crumbled stock cube. Add double the volume of water. Bring to the boil, then reduce the heat and simmer gently for 20 minutes. 3 While the quinoa is cooking, put the courgettes, peppers and red onion into a roasting tin and drizzle with the olive oil. Roast for 20-25 minutes, until tender. Remove from the oven and stir through the cherry tomatoes. 4 Drain any excess liquid from the quinoa, then mix it through the roasted vegetables with the spinach or watercress. 5 For the dressing, whisk together the olive oil and lemon juice. Season to taste with salt and pepper, then drizzle over the salad. Serve, sprinkled with crumbled feta cheese and chia seeds.